Medium in length, slender, triangular in cross-section bodied snake with a short tail. Can grow to a maximum of about 1.85 metres ( B. m. multicinctus ) or 1.25 metres ( B. m. wanghaotingii ). Head is flat and slightly distinct from neck. Eyes are small in size and black with a barely visible round pupils. Nostrils are large. Dorsal scales are smooth and glossy with the vertebral row slightly enlarged. Dorsal scale count 15 - 15 - 15. Elevations up to about 1300 metres in a wide range of habitats ( bamboo forest, coastal rainforest, dry to moist subtropical forest ) but most common in lowland plains and hilly regions in subtropical to moist open forest terrain. Nocturnal and terrestrial snake. Tends to hide under stones or in holes during the day. Never found too far from water. Inoffensive distribution. When disturbed it coils loosely and hides its head beneath its body. Reluctant to bite except upon persistent provocation. Feeds mainly on snakes, but will occasionally feed on eels, fish and frogs. 11 mg ( dry weight ), Sawai (1976) ( Ref : R000769 ). 4.6 mg ( dry weight ), Gopalakrishnakone and Chou (1990) ( Ref : R000004 ). 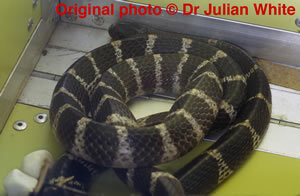 Krait bites can cause moderate to severe flaccid paralysis, respiratory failure, requiring intubation & ventilation in severe cases. Antivenom available for major species, may prevent worsening of paralysis, but may not reverse established paralysis.